Okada Takahiko, Taki, Yoshimasu Gozo, Amano Michie, Nakahira. Provoke: Provocative Materials for Thought, Volumes 1-3 - AND - Provoke 4 & 5: First Abandon the World of Pseudo-Certainty. The Complete First Edition Collection. 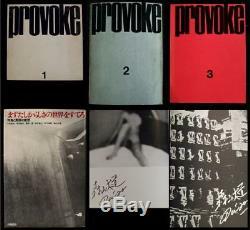 Provoke 2 and Provoke 3 Signed by Daido Moriyama. This is a scarce first edition, first printing collection of the legendary photobooks Provoke: Shiso no tame no chohatsuteki shiryo [Provoke: Provocative Materials for Thought], Vols. 1-3 & Mazu tashikarashisa no sekai o sutero (First Abandon the World of Pseudo-Certainty) [Provoke 4 & 5]. As Kotaro Iizawo explains in The History of Japanese Photography, the aim of the enormously influential Provoke movement was to rethink the rigidified relation between word and image, and to create'new language, in short, new thought. " Founded by Koji Taki and Nakahira Takuma in late 1968 (Daido Moriyama joined the group for their second issue), the group produced "fragmented images that completely demolished the established aesthetic and grammar of photography.
" In keeping with the tumultuous events of that year, the artists of Provoke were fierce in their desire to do away with received ideas and meanings ("the world of pseudo-certainty). And, in true avant-garde spirit, theirs was a frontal assault on the medium and the institutions in which they were working. As individuals, however, they were constantly at odds with one another; Provoke, their house organ, ceased publication in August 1969 after only three issues. Provoke 4&5, published a year after the dissolution of the group, represents their final statement and contains five portfolios, Provoke 1-5, and six texts, Predict 1-6. The portfolios are by Nakahira, Moriyama, Takanashi, Taki, and Taki & Moriyama. The texts are by Taki, Okada, Moriyama, Amano, Takanashi and Nakashira. The following are the details on the four books. 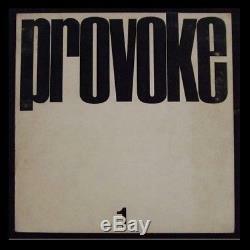 Provoke 1 Published by Provoke-sha, Tokyo on November 1, 1968 with a limitation of 1000 copies. Containing halftone reproductions of photographs by Nakahira, Takanashi and Taki with text by Okada Takahiko and Taki, the book is bound in white printed wrappers and measures approximately 8.25 x 8.25. The condition of the book is Near FINE with a minute tear and a bit of rubbing and faint foxing to the front cover. The rear cover is lightly dust soiled and the verso has a very tiny previous owner's stamp. Internally the book is crisp and tight. There is no denting to the corners or foxed pages. The last page of the book (inside back cover) shows some waviness on the spots where the publisher glued the page to the cover. 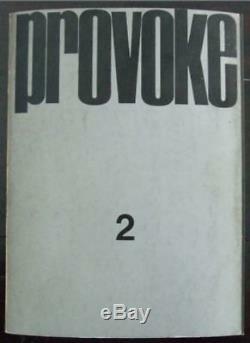 Provoke 2 Published by Provoke-sha, Tokyo on March 10, 1969 with a limitation of 1000 copies. 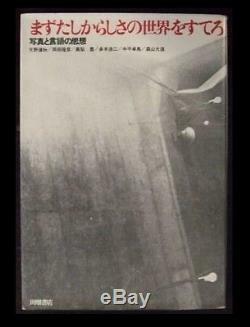 Containing halftone reproductions of photographs by Moriyama, Nakahira, Takanashi and Taki with text by Okada. The book is bound in grey printed wrappers and measures approximately 9.5 by 7.125. The yellow bellyband is not present. 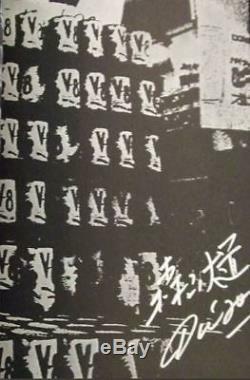 Daido Moriyama has signed the book in both Japanese and English below one of his photographs. The condition of the book is Near FINE with moderate dust soiling to the covers and a tiny bit of surface loss along the edges of the spine. There is also a small previous owner's stamp on the front endpaper. 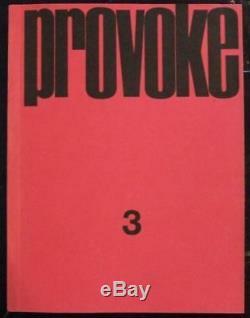 Provoke 3 Published by Provoke-sha, Tokyo on August 10, 1969 with a limitation of 1000 copies. Containing halftone reproductions of photographs by Moriyama, Nakahira, Takanashi, and Taki with text by Okada and Yoshimasu Gozo. The book is bound in red printed wrappers and measures approximately 9.375 X 7.25. The condition of the book is FINE- with light fading to the spine. There are no other notable flaws. Provoke 4&5 - First Abandon the World of Pseudo-Certainty (Mazu tashikarashisa no sekai o sutero) Published by Tabata Shoten, Tokyo on March 31, 1970. Containing halftone reproductions of photographs by Moriyama, Nakahira, Takanashi and Taki with text by Amano Michie, Nakahira, Okada and Taki. The book is bound in photographically illustrated wrappers in a matching dust jacket and measures approximately 8 x 5.625. The condition of the book is FINE- with a very small bookstore sticker on the first free endpaper. The dust jacket is in FINE- condition with very minimal surface wear. Cited in The Open Book by Philip Roth, The Photobook: A History by Parr & Badger, The History of Japanese Photography by Kotaro Iizawo, and Japanese Photobooks of the 1960s and 70s by Ryuichi Kaneko and Ivan Vartanian. Who we are - D&D Galleries was founded in 1985. We are members of the Antiquarian Booksellers Association of America (ABAA), the International League of Antiquarian Booksellers (ILAB), and the Provincial Bookfair Association of Great Britain (PBFA). Our inventory (largely English language only) is slightly eclectic and ranges from the 16th through the 20th centuries with sub-specialties in S.
And Wing books, Lewis Carroll, Charles Dickens, presentation and association material as well as 17th and 18th C. British history, sets and bindings. The item "Provoke 1-5 The Complete 1st Edition Collection, Signed by Daido Moriyama" is in sale since Friday, February 2, 2018. This item is in the category "Books\Antiquarian & Collectible". The seller is "dnd-galleries" and is located in Somerville, New Jersey.